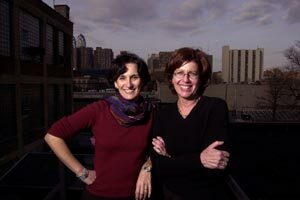 Barbara Attie and Janet Goldwater have worked together since 1990, making award-winning documentaries for national and international broadcast. In 2005 their contribution was recognized when they were awarded the Pew Fellowship in the Arts. Sharon is an Emmy Award winning independent producer-director and editor whose work regularly appears on local and national public television. Her most recent editorial work includes QUEEN OF THE MOUNTAIN (Martha Lubell Productions, 2005), an intriguing portrait of an eccentric American archaeologist working in Turkey in the 1950's and FROM PHILADELPHIA TO THE FRONT (Gelles and Bernstein, 2005) about Jewish WWII veterans. Recent work as a producer/director includes KNEE DEEP (2004) with Ann Tegnell, FADI FLIES A KITE (2003), RUFUS JONES - A LUMINOUS LIFE (2002) with Barbara Attie, winner of a CINE Golden Eagle Award, and DARING TO RESIST. Sharon has been a board member and workshop leader for PIFVA (Philadelphia Independent Film/Video Association) and an instructor at the Scribe Video Center. Her editorial work has appeared in the Human Rights Watch Film Festival, the DoubleTake Documentary Festival, and the Philadelphia Festival of Independents. Peter has worked as a freelance cameraperson since 1984. His most recent full-length documentaries are MAGGIE GROWLS, DARING TO RESIST, LANDOWSKA and ARGUING THE WORLD. Prior to 1984 he worked for seven years as field camera for KTCA TV (PBS) in St. Paul, MN. Freelance clients include: Frontline, NOVA, Newshour with Jim Lehrer, Great Performances, BBC Panorama, BBC Newsnight, ARD Television (Germany), Deutsch Welan (Germany), and IKON Television (Holland). Selected awards include: Gold Plaque, Chicago International Film Festival; Blue Ribbon, New York Film Festival; Bronze, Houston International Film Festival; CPB award; Charles Stuart Mott Award; and the Dupont Columbia Citation. Sumi is an acclaimed musician in the areas of performance and composition. 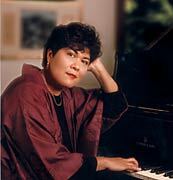 She has composed the scores for numerous documentaries, including the Academy Award nominated FAMILY GATHERING (1988), SUSUMU (1991), DARING TO RESIST (1999) which was co-produced by Barbara Attie, and QUEEN OF THE MOUNTAIN (2005). A highly praised jazz pianist, Tonooka has recorded five cd's, the most recent of which is Secret Places, with Rufus Reid (bass) and Lewis Nash (drums). 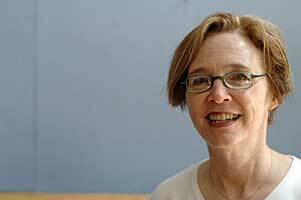 Her original compositions have been called "provocative and compelling" by the New York Times. A 1993 commission from Meet the Composer and an NEA Jazz Fellowship led to the New York premier of the Taiko Jazz Project, wherein Tonooka scored eight interrelated pieces based on the I Ching to feature taiko master Kenny Endo. To find out about her new recordings and projects go to SumiTonooka.com.